How do we have to analyze this now? I think my colleagues were hoping for the standard answer: If you draw a Net-Map, these are the steps you have to do and these are the centralities / network properties you have to look at and if the value is over 0.5 it means this and that. Yesterday I sat down with Ekin Birol (IFPRI) from the avian flu project and we had a look at our risk communication and value network maps. To know what we want to look at, we have to think about what makes sense. For example in terms of spreading information, we might want to look at the out-degree of actors, meaning: How many links does each actor have where information is given by this actor to others. When looking at spreading the disease along the value chain, it might make sense to look at the closeness centrality: How many steps is one actor from everyone else in the value chain. Because if you imagine someone who handles live birds and is only few steps away from everyone else in the network, an outbreak of avian flu at this point would spread much more quickly throughout the whole system than if you have someone who is many steps away from most other actors. This is why we need to look not only at the farmers but also at the traders and transporters of birds as crucial entry points of risk. When talking about risk communication, the communication of a suspected outbreak up the line to the responsible authorities, we might want to know who are the potential cut-points in the network (if they are removed, the network is cut in two or more unconnected clusters) or who has the highest betweenness centrality (connecting actors who are not otherwise linked) because these actors are crucial in making sure that the information actually (and quickly) moves from the infected farm to the authorities, so that action can be taken. I give these examples to allow you to follow my kind of reasoning and, if you are doing your own network analysis, to understand what kind of questions you can ask yourself to understand which measures matter in your case. My colleague Elias Zerfu (IFPRI) works in the IFPRI offices in Addis and yesterday he showed me some of his exciting work that runs under the title “Managing for Impact” (read their cool blog). 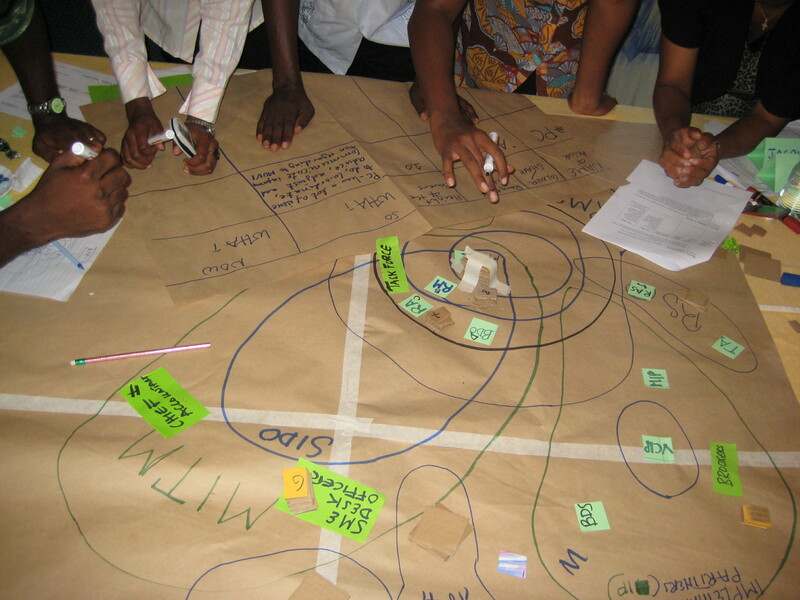 He promised to write some more about it, but let me sneak in this picture of a power map that he did with a group in Tanzania. You can see (if you have a very close look) that he used piles of card-board squares to build power towers, he added little cards with symbols for the different actors (to make it easier for illiterate participants) and also symbols for the different activities with which these actors influence what’s happening. Power Mapping is the predecessor of Net-Map and has no social network component. Read up on it here, if you are interested. Together with my colleague Frank Hartwich from the Swiss College for Agriculture I am working on a paper about the influence networks of a multi-stakeholder water governance organization in Ghana and today he pointed out the different kinds of brokers to me that you can have in a network. He will do some impressive quantitative analysis of brokerage levels, I am sure, but even if you just want to think about it, without calculating the actual values for different members of the network, it helps to understand, how things (like information, ideas, gossip) flow in networks where people belong to different groups. The Liaison, brokering the relationships between members of two different groups without being part of either. In your quantitative analysis you can now calculate the difference between the brokerage score of actors, if links were randomly assigned and the actual brokerage position. Thinking about different brokerage roles, I realize again, why I find Social Network Analysis so helpful: Because it helps me to structure my own brain and the way I think about complex social relations. So this sets me thinking where in my personal and professional life I act as coordinator, consultant, gatekeeper or liaison.